Making money on YouTube is possible when you monetize your content. Generally payment will go through Google AdSense. Be sure to always have a backup source of income. However, YouTube should never be all about money, but rather building a community and interacting with your viewers, as well as having fun in the process. Growing your channel is essential, but don’t spam promote. I’ve seen so many comments like, “Come check out my channel and watch this video I did.” And guess what, they spam this on many videos, especially popular ones, and ALL their comments get marked as spam. Relatedly, be very careful about posting links to other videos to promote your channel. 99% of the time any comment with a link, even if it’s another YouTube video, will be marked as spam and no one will see it. Once Google+ marks you as a spammer, it can be difficult to reverse that process. Almost all the so called “spam” comments I receive on my videos are, in-fact, not spam but rather what Google+ considers spam because the person replied to a lot of people in a short amount of time. It’s a shame it happens, especially when spam is auto-deleted, but it does happen and you have to comment moderately and appropriately to get your reputation back. And, by doing this you’ll get your channel noticed by more people which can help grow your channel. YouTube should never be solely depended on as a source of income since it fluctuates. Let’s say one day you make $100, then the next you make $80, then $50, then $150. Because of this fluctuation, it’s not like a steady paying job. There will be months that you will make less, and months you will make more. Unless you are making way more than your lifestyle calls for, then it should be out of the question of being a reliable, steady source of income. Relatedly, you should always have backup sources of income regardless. Because, while being on YouTube allows you to be creative and express yourself, you’re still relying on a company, Google, to make it happen for you. Human beings run Google and any other company for that matter, and we all make mistakes and mistakes that Google makes that impact YouTube can have a direct effect on you, your channel, and how you make a living for yourself. So definitely have a backup plan and think ahead. Monitoring your own stats on YouTube are easy by looking at the analytics for your own channel. You can do this on the ‘Analytics’ page or use the ‘Creator Studio’ app on your mobile device. There is even a website, SocialBlade.com, that gives estimates on views, subscribers, earnings, even tells you if they are signed with a network. 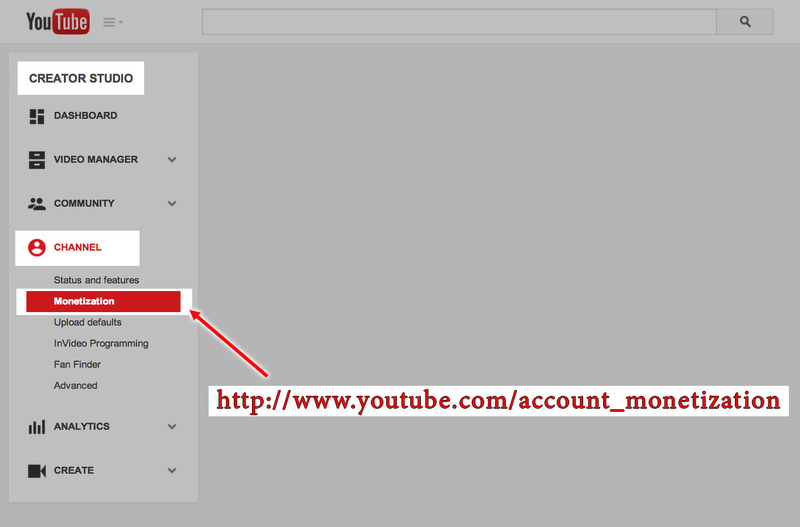 This can help you monitor your competition or even just other users on YouTube. The estimates it gives are pretty accurate, but they also fluctuate quite a bit. Additionally, Social Blade is not so much accurate when a user deletes a video or makes it private. This is represented by a decrease in total views which influences the statistics of the channel, especially if the deleted or private video had a large amount of views. But again, this is for monitoring other channels. 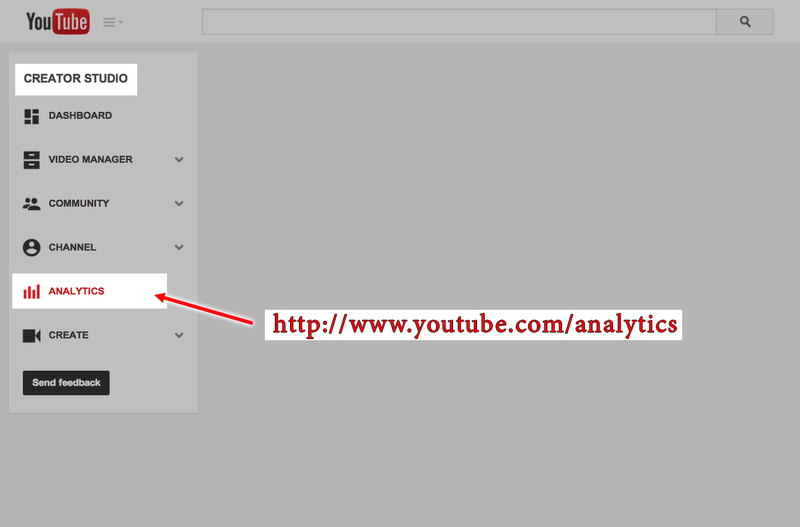 Your own channel should be monitored by YouTube’s Analytics. Also, YouTube is not all about making money. If that is your goal then you have lost touch with what you really doing on here. It should be a place where you can educate, entertain, whatever your channel is about. And, find people with similar interests and build a community to interact with. While it may be a job for many large channels, it should primarily be fun and helpful to the creator and viewers. Doing something you love and helping others as a job or hobby is excellent, and if you get some money for doing the things you love, then that’s great. So, I will discuss how you can monetize your content and make money from YouTube. In order to make money from YouTube, you have to monetize your content. Essentially how this works is advertisements are placed either on the side of the video, overlayed as a banner in the video, or a video ad that plays at the beginning, end, or at several intervals throughout the video. So those ads you see on YouTube, that is how the creator makes money. Additionally, the yellow bar on the player indicates an ad. 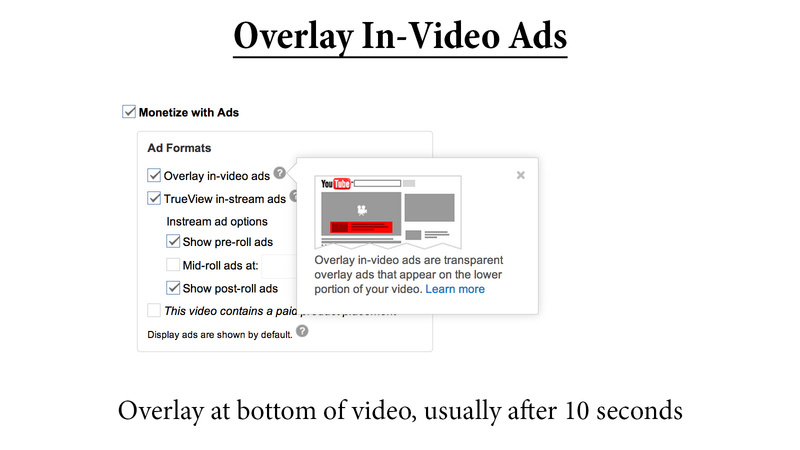 The video, depending on its duration can contain any number of ads. Display ads are always shown. 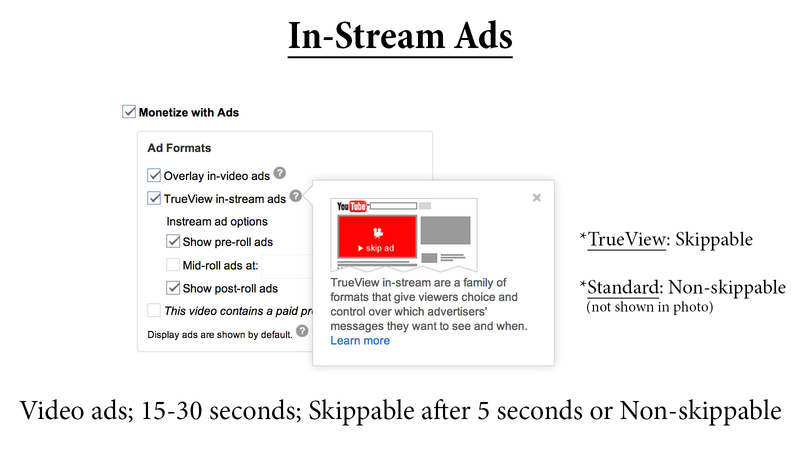 Overlay in-video ads usually display after about 10 seconds of the video start if an in-stream ad doesn’t play. Then there are in-stream ads which are video advertisements. It may be 15 or 30 seconds long that may or may not be skippable after five seconds. But, that is the longest allowed duration for a non-skippable ad. 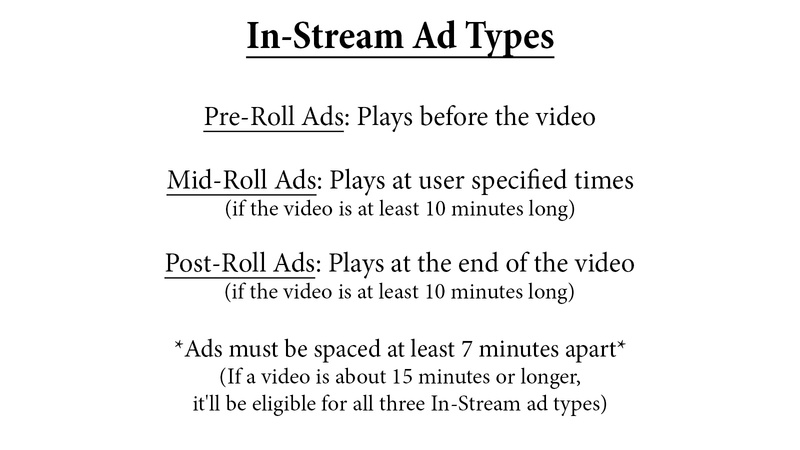 Pre-roll ads play before the clip, post-roll ads play at the end of the clip, and mid-roll ads play at user specified points during the clip. 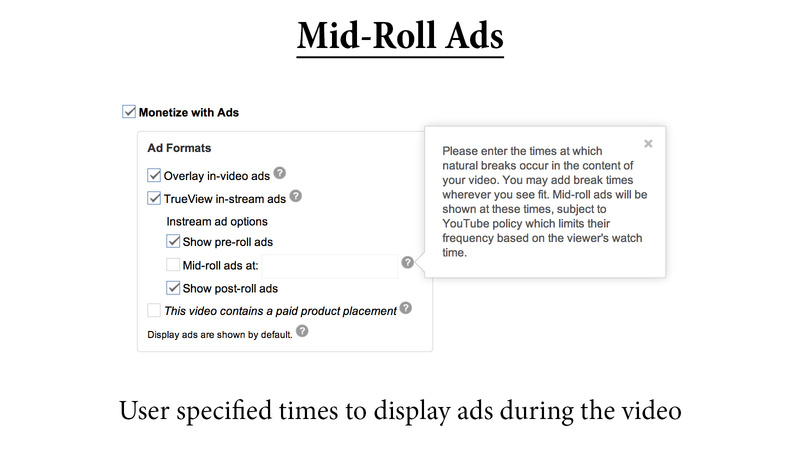 Post-roll and mid-roll ads can only be activated if the video is over 10 minutes. Likewise, ads must be spaced at least 7 minutes apart. So ideally, if your video is over 15 minutes, it’ll be able to have all of these. 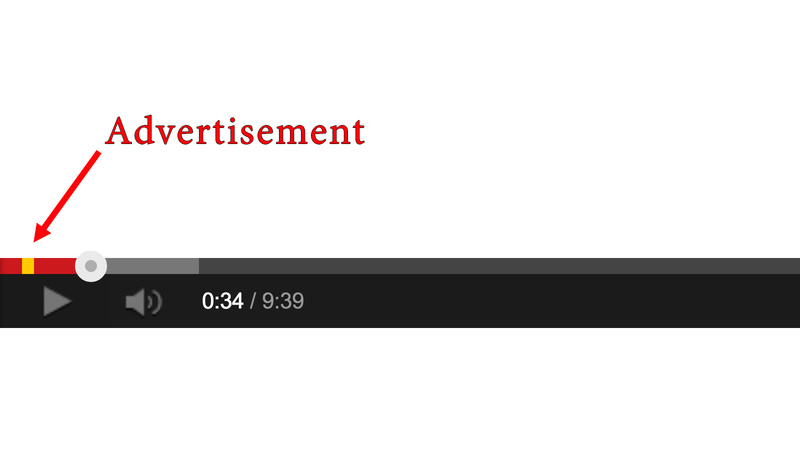 I personally find mid-roll ads incredibly annoying if they are video ads since I feel it takes away from viewership. Anyway, in order to monetize your content you will need to go to the ‘Monetization’ tab under channel in ‘Creator Studio.’ You need to join the Google AdSense program. AdSense is Google’s hub of displaying ads from their AdWords advertising campaigns. AdWords is the place where advertisers go to advertise their products or services and pay per click or impression. 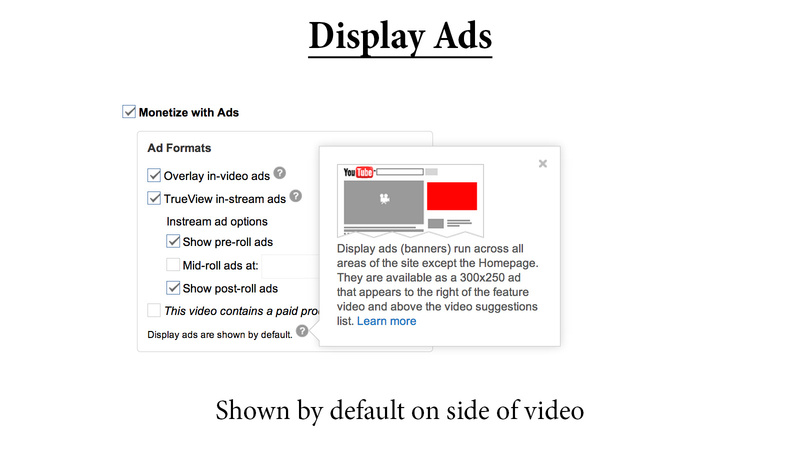 The money advertisers spend pay Google and the creator of the video on YouTube or website, or wherever the ad is placed. Displaying ads are entirely free to the user, only the advertiser pays. If you own a website, AdSense allows you to put ads on your website and make money from them. Advertisers using Google AdWords essentially buy space on your website or videos to advertise their merchandise. AdSense is the place all your money goes through. If you make money from three YouTube channels, two websites, a blog, it’ll all go through AdSense. Only one AdSense account is allowed and that’s all you need. Google AdSense pays at the end of each month with a $100 threshold minimum. So, if you’re only making $10 a month on YouTube, it’s going to take at least ten months to get paid. The best way of getting paid is by direct deposit to your bank account. Also, AdSense money is taxable, it’s income. And, if you make over the government required amount to pay taxes, Google will send you a 1099-MISC form at the beginning of the tax year and you will need to file for taxes. Failure to do so is a criminal offense. Also, YouTube takes a pretty hefty portion of your earnings. You never really see this because the stats you view, such as your estimated earnings, only show what you actually profit, after what they have taken. But, YouTube takes around 45% of the total earnings you make. This is essential because that is how they can pay their employees and keep up with server and bandwidth costs of their site. So, if you make $500 one month, the actual income would be around $900, but YouTube takes the $400. Again, you don’t ever actually see this unless you dig around your analytics because they always show you what you actually profit after their cut. And lastly, you can only monetize content you own all the rights to, or have legal permission to use the copyrighted material in your video, or at the very least, the content you include is in the public domain, under a ‘Creative Commons’ license that allows you to distribute the work commercial, or it falls under the ‘fair use’ category. When you use copyrighted music in your videos, most of the time YouTube’s Content ID system will flag your video and you will earn no money from it, but the copyright owner will. More seriously, your account may get a strike or your video even deleted. You can always file a dispute if you believe it is incorrect, but be careful. I’ve seen so many videos that get millions of views, but the person used a copyrighted song and they cannot make any money from it. So, it is possible to make money from YouTube, and to even make it a full-time job. Doing so is as easy as getting a Google AdSense account and monetizing your content, building your channel, growing your audience, but more importantly, be yourself and doing what you love. YouTube should never be all about money, but rather doing what you enjoy doing. If you make some money from it, then great. But, always have a backup plan just in case because your earnings can fluctuate dramatically. I hope this video was informative and helpful. Thanks for watching! Many people have asked me, “What is your job? How do you make a living?” Well here it is! I earn money through ad revenue. This is a major source of my income. I make a video, publish it online, and ads are displayed where I can earn money. Unfortunately, if someone blocks the ads from appearing, then I will not earn anything. It’s not about money per 1,000 views or anything like that, it’s about MONETIZED views. In other words, if someone blocks ads, or the ads simply do not show (which they don’t 100% of the time) then I will simply not make anything since the advertiser is not present to pay to promote their product/service.